When the Best International Pale Ale trophy at the 2015 Australian International Beer Awards went to Temple Brewing for its Anytime Session IPA, it felt like more than just an award for a beer. Having been on the brink as a business as recently as 2013, the award was something of a landmark moment for the new business that emerged last year. However, the crescendo of what's been a truly significant year for Temple Mk II has, appropriately, been left right until the end with the final act of the Melbourne brewery the release of a new Double IPA. 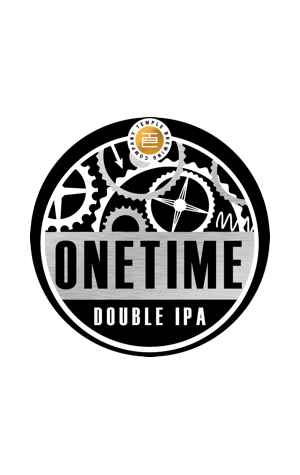 It’s the brewery’s first and will become an annual release, thus the name: Onetime. Building on what they achieved with the Anytime, where the idea was to pack plenty of hop action into a small package, the brewers wanted to show what they could do when the requirement to be "small" was removed. Thus, having plunged their hands deep into their hop collection, they came out armed with five different American varieties: Citra, El Dorado, Mosaic, Simcoe and Amarillo. From those they've created what sounds like a veritable fruit salad on the nose: “sweet, upfront aromas of fresh passionfruit, mandarin and green pineapple” they tell us, followed by “a deep fleshy fruit profile of mango and orange.” On the flavour front, you'll be looking for characters of “freshly cut grass with an underlining earthy base, giving you a massive, resiny hop hit” all wrapped up in 90 IBUs worth of bitterness (which is to say, quite a lot). They expect that when they come over all Fugee like and brew Onetime two times in a year's time it’ll go into large format bottles and be available across the country. However, this first version is keg only and will remain within Victorian borders. It’s being tapped at the brewery at 12pm on December 12 so get it while it’s at its freshest and bestest.